Second Sight Spirits is a small, artisan distillery located in downtown Ludlow, Kentucky. The term “second sight” refers to an extrasensory ability to see visions of the future. The founders of Second Sight Spirits, Rick Couch and Carus Waggoner, see a new vision of artisan distilling that will focus on premium, local products presented in an innovative way. We believe everything we do should be good for the spirit. Our mantra not only guides us to use the best ingredients and techniques to create a premium spirit but directs the company to excite, engage, and entertain our customers. Second Sight Spirits will invest in the community as they invest in us. Our goal with the distillery is to have a space that can be used not only for corporate functions, but also hold a variety of charity events. 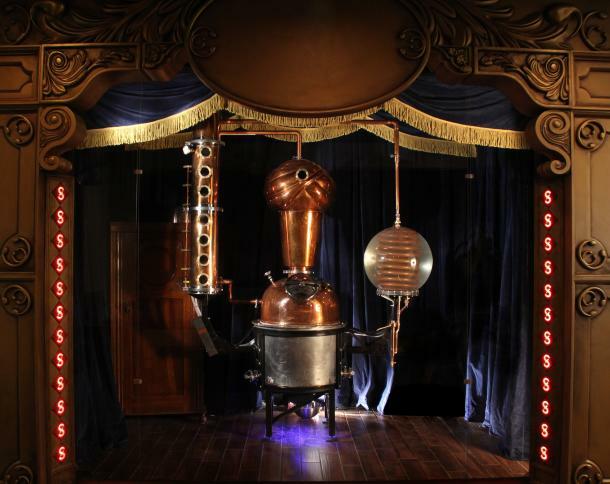 The distillery will be alive with the world’s first performance art still that will engage the visitor and make the distillery a true destination for tourists. Backgrounds in mechanical engineering and industrial design led Rick and Carus to careers on the Las Vegas Strip creating two of the world’s largest shows, Cirque Du Soleil’s LOVE and Viva Elvis. Being surrounded by the inspiring sights and sounds of Las Vegas gave Rick and Carus an intimate understanding of the processes and techniques it takes to make a world class product and present it in an exciting way. Second Sight Spirits will bring this creative experience to Northern Kentucky. Tasting Room Hours: Thursdays & Fridays 4-8 p.m. Saturdays and Sundays 12-5 p.m.